I often hear complaints about road construction. Indeed, at times I have sat behind the wheel, itching to get going, as some flagman halted traffic for fifteen minutes. 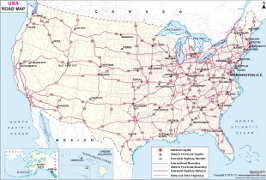 However, for all these minor inconveniences, the U.S. highway system is among the best in the world. On my furloughs I log thousands of miles every summer, on roads that take me everywhere. The Great American Road is a privilege to have. Construction is necessary if we are going to maintain and keep this excellent system. So the next time you are out driving and get stopped for road work, remember, it all goes to keep that road part of the best highway system in the world. Appreciate it! In this day and age I constantly hear people talk about how they much prefer to fly rather than drive. The reason: they can get there more quickly. If speed is what you want, I agree wholeheartedly. Especially when traveling overseas. Driving from the United States to Brazil would be difficult if not impossible. However, I have come to view travel as more than just “getting there”. This is especially true of travel within the United States and Canada. And the great road system mentioned above is one of the chief factors. When driving becomes a pleasure, then I want to take the time to enjoy the pleasure of driving. Scenery is probably the biggest attraction. As the saying goes, “half the fun is getting there.” Well, if all I could do was drive through endless city, I would probably end up in a mental ward. Fortunately, America has been blessed with vast wilderness, with forests and plains and shores and deserts and mountains and much, much more. And as I travel I like to see as much of it as I can. This type of travel often involves leaving the Interstate Highway system behind. The best roads are not the great arteries that link the centers of our civilization together. Highway 101 along the Oregon coast is much more interesting that buzzing along on Interstate 5 further inland. One thing to remember: when traveling to enjoy the traveling, you need a different mindset. If you drive by the clock and try to cover great distances, you will never be able to enjoy traveling for the sake of traveling. So I have learned to take things as they come. If I see a nice place to stop, then I stop. I go walk on the shore. I go and wander up a trail. If the road construction people put out their “STOP” sign, then I shut off the motor and get out and stretch my legs. If I have a camera with me, I take a picture. Or two or three. Even with this mindset, I still end up doing a fair bit of traveling on the Interstate system. And one of the great benefits of the system are the Rest Areas. You find them in every state, and they are easily accessible without having to drive out of your way. Available services vary, but all have bathrooms and picnic tables. Normally, I stop for lunch or when my bladder is about to burst, but there have been times when I was exhausted because I hadn't slept well the night before, and so I stopped and laid down on top of a picnic table for a half-hour or so just to recuperate a bit. When you're not in a hurry, it's not a problem. Are you starting to get the idea? Sadly, I haven't encountered very many other people who feel the same. Time after time I hear about someone's “marathon drive” where they got on the Interstate, put the pedal to the floor, and kept going all day and all night just to get to where they were headed. Then when they arrived they were so wasted that they had to spend the next two days recovering. If that is the way you want to travel, then be my guest. But don't expect me to go along with you! Over the years I have learned that motels and hotels are not cheap. Indeed, the cost of lodging can be one of the major expenses of any road trip. Fortunately, there is an alternative, one which I have come to enjoy and look forward to: Camping. America is absolutely chock full of wonderful campgrounds. National forests, national parks, state parks, private campgrounds, and more. You can find campgrounds in the woods, campgrounds in the desert, campgrounds in the plains, campgrounds along beaches, and so forth. You can find campgrounds that cost nearly as much as a hotel to stay in. And you can find myriads of campgrounds that don't cost a dime. In my experience, I have found that camping in the West is the best. For me there is no comparison. Mountains, forests, river valleys and more. I like best the campgrounds found in national forests. Many of them are free, which is an added bonus for one who does not count himself among the rich. There are a number of good sites on the Internet for finding information about camping. I have listed some of them in the column on the left, and recommend them to you if you are looking for information on good places to enjoy the great outdoors. Since I tent-camp instead of using a trailer, I do not have the luxury of a refrigerator. I normally take two ice chests: one to store food and the other to store drink. Ice cubes are fairly easy to find. (I really prefer block ice, but it has gotten to be pretty rare these days.) Once in a while, when I am in some high elevation where there is still snow, I will use some of the frozen white stuff in place of ice. The idea is to keep things cold—or at least reasonably so. I also discovered the advantages of a gas/propane Coleman stove over charcoal. Charcoal may be nice, but it's also messy. I practically never cook anything for breakfast, preferring a simple bowl of cereal or some donuts, along with fruit juice. Unless I am hiking, my main meal is lunch, when I get out the stove and cook a hamburger, along with stuff to go with it. For supper I usually just make a couple of sandwiches. If I go on a hike during the day and am gone over lunch hour, I will reverse lunch and supper and have a picnic on the trail. Nope, no pizza. Nothing fancy. And even though I enjoy my camping meals, it is still nice on travel days to stop at a Pizza Hut for lunch buffet, or a Subway, or even a good Chinese restaurant if I spot one. A little variety adds enjoyment. Whenever possible, I look for campgrounds that have trailheads either in the campground itself, or else within easy walking distance. These days, sites like the ones in the left column make it possible to know in advance what amenities and recreational opportunities will be available. Occasionally, some site will get it wrong and something I am expecting won't be there: some trailhead, or running water, or whatever. But most of the time they get it right. I don't usually hike every day, at least not long hikes. Back in my younger days, I could have done it. But I was born in 1957, which was a long time ago, and these days I normally need a day of rest. Short hikes are different; I can do those more often. If I am in a national park, however, I will often break my rule, simply because there is so much to see. Afterward, I usually go to a campground without any nearby trails, just to “catch my breath”. If I go on a long hike, where I will be gone for several hours, I like to leave by around 8:00 or 8:30 in the morning at the latest. Since it is generally still cool at that hour, I usually wear a jacket or sweater when I take off. However, I also take along my shorts in my backpack, in case it warms up considerably during the day and I want to step into a grove of trees and change. In addition to stuff for a picnic lunch, I also toss in at least a couple of Gatorade bottles with tea or lemonade or Gatorade itself; three if there is space. Everything packed, I change into hiking boots, get my walking stick, and hit the trail. A camera is essential. Also, I take a small notebook where I write down the file number of every picture I take, along with a description of what it is. That way, I can reconstruct my photo journey without forgetting what some particular picture was. One of the nicest things about camping is waking up in the morning and smelling pine trees instead of hydrocarbons. It's usually chilly, so I get dressed a bit at a time, still snuggled into my sleeping bag. Finally, I climb out, finish the job, and open the tent flap. Once I was greeted by a friendly chipmunk who dashed inside for a moment, looked around, then fled. As I said, I do not usually go hiking every day. When I don't go, I like to sit around the campsite and read. If there is a lake or stream or other scenic spot, I will often park my reclining deck chair near it. From time to time I like to wander around the campground just to stretch my legs. At times I will meet fellow campers and get the chance to visit with them. Meal preparation usually takes longer than when doing it in a kitchen. So I will end up spending an hour and a half or so preparing lunch; getting out the ice chests and food box, setting up the Coleman stove, preparing the food and cooking it, guarding against thieving chipmunks and birds, etc. Cleaning up afterward also takes a bit longer, and I usually have to economize water since unless there is a working spigot at the campground, I'm limited to what is in my 7-gallon jug. But the inconveniences are far outweighed by the simple pleasure of sitting at a picnic table and munching quietly, enjoying the background smell of pine trees and the sound of wind in the branches. Since I am not engaging in social activities, I usually just wash my arms and face, unless there happens to be a bath house at the campground. Those are usually only found in private campgrounds or in state parks, and not in national forest sites out in the boonies. I do a cursory job shaving, and at times don't even bother. The bears don't mind. In the places I like to camp, temperatures can vary quite a bit. It will often be in the 40's when I get up, but climb to the 70's or even higher by mid-afternoon. Shedding sweaters and changing pants is part of the daily routine. Then late afternoon the temps start to drop, and the shorts are replaced again by jeans. Out comes the sweater, and eventually a jacket. By the time I climb into the tent (or my car if I decide to sleep in it; I do that from time to time if the weather is uncooperative), it is usually pretty chilly and I am glad to crawl into my warm sleeping bag. Incidentally, although I usually do have my laptop with me on camping trips, the only thing I use it for is to copy pictures off my camera to free up memory space so I can take more. Over the years I have taken a number of camping trips. Some were taken just for the pure joy of getting away from it all. Some were “side benefits” of travel to some specific place. Sometimes I traveled from beginning to end without seeing anyone I knew. Other times I would stop along the way and visit friends. And each time I learned more things that enabled me to better prepare for subsequent trips and enjoy them more. Here are some more detailed accounts of some of my trips.